My husband and I visited Soldiers Delight Natural Environment Area yesterday – taking advantage of the dry fall day before a few days of forecasted rain. It’s located less than 45 minutes from our house and I’ve had it on my list of places to visit since I was in Master Naturalist training a few years ago; I’m a little surprised that we haven’t found the time before now. The visitor center is open on Saturdays and sporadically on other days. We got there shortly after 11 and there was already quite a lot of activity. We got a map and headed out to hike. Rather than hiking from the visitor center, we drove a short distance to an overlook that doubles as parking from some of the trails. The overlook shows the area back toward the visitor center. The loop trail we took started across the road – following red blazes then orange and rejoining the red to get back to the overlook. It past some remains of one of the mines – fenced off to prevent accidents. There were leaves beginning to fall. 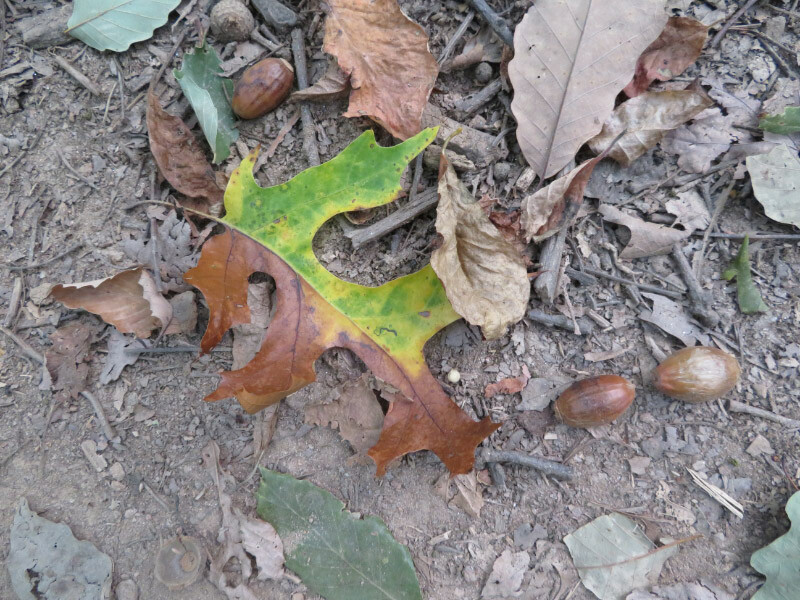 Some of the oaks had a very large crop of acorns this year judging by the piles on the path. 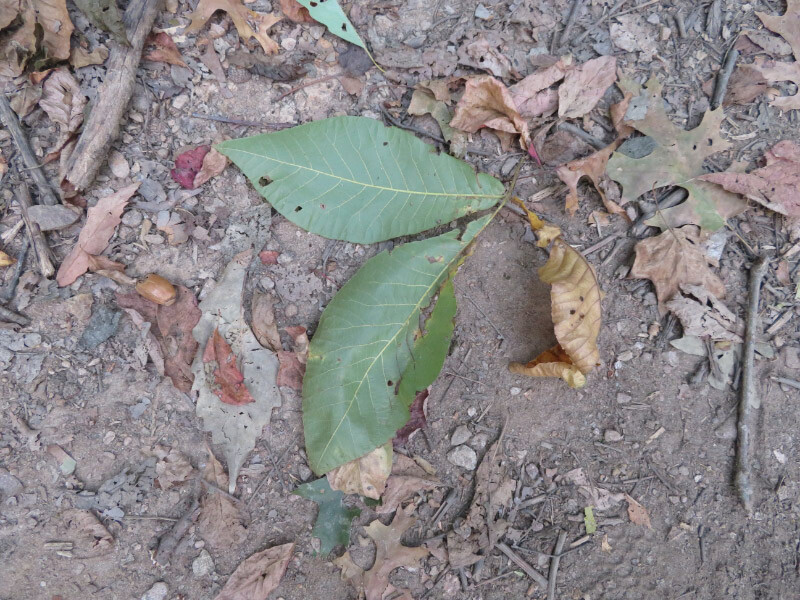 My favorite leaf was a red sassafras. There were some areas of invasive plants but not as many as places that have richer soils. 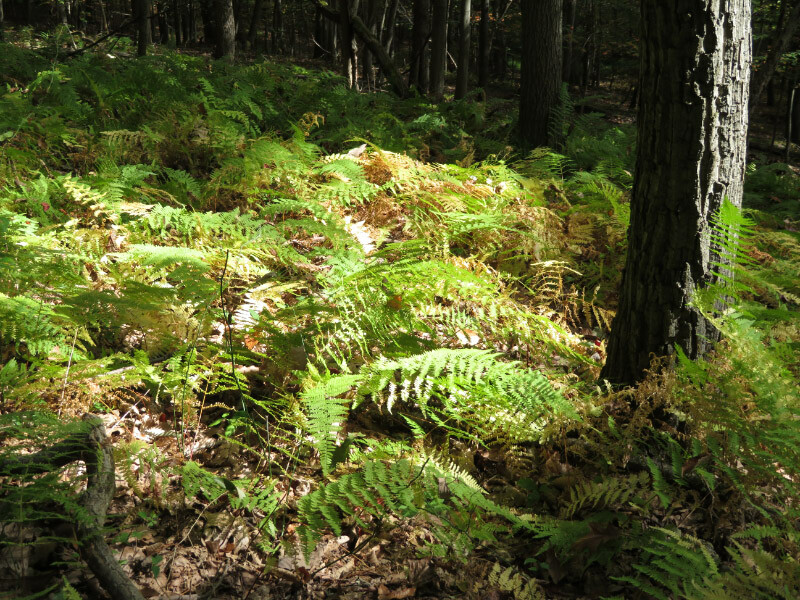 There were swaths of ferns in a few areas. We walked down to a little stream. The water runs over bedrock in most places. The critter-find for the hike as a fuzzy yellow caterpillar with some black tufts. I looked it up after I got home – an American Dagger Moth Caterpillar. It eats oak leaves – among other things. More than half the path was over rocky areas; Soldiers Delight is – after all – a serpentine barren.